Musings of a Menopausal Melon - mmm! 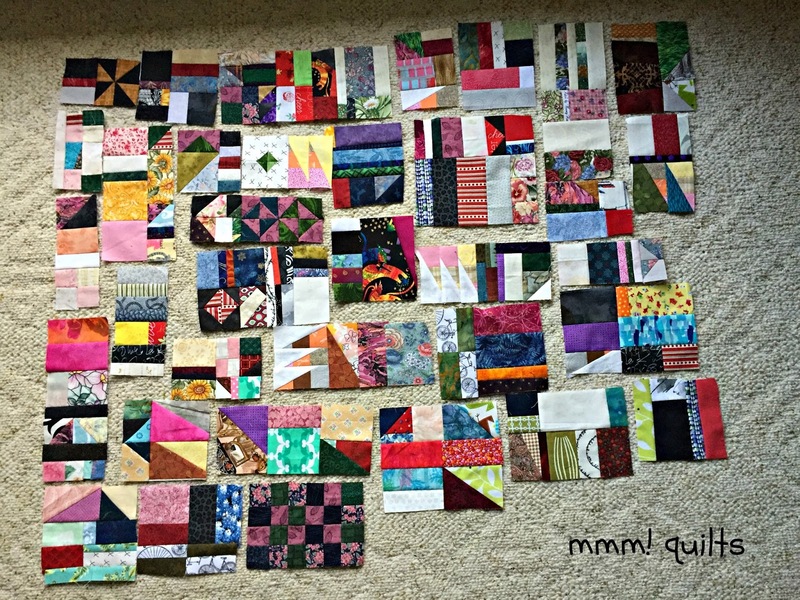 quilts: Scraps, Scraps and More Scraps! And they do NOT seem to get any less in volume!!! Like HOW?? Yellow with a bit of orange was Angela's directive. 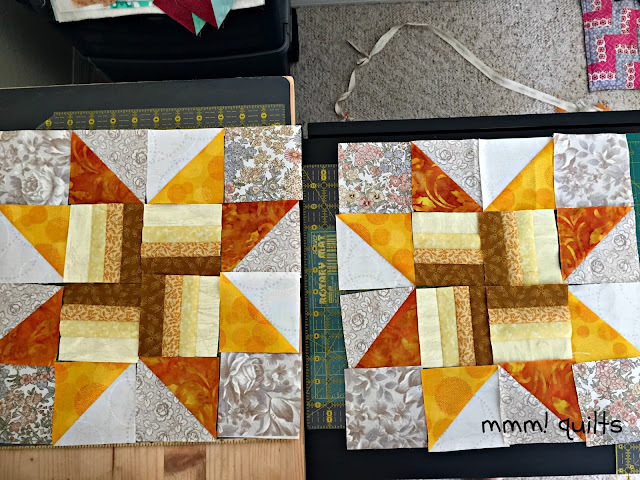 I had the perfect scraps of batik for one set of star points and the yellow with orange dotted spots was from a fat quarter stack I was given from Benartex for promoting their Modern By the Yard magazine, which btw, has another new edition coming out Monday! 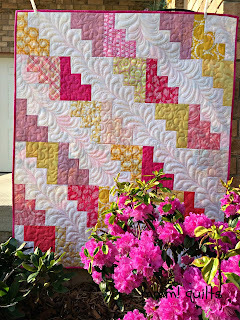 I thought the star point fabrics I used were absolutely perfect for what Angela had us working with for the month. I thought I'd show you my process by which I arrived at those two blocks before I show you the layout on my design wall of all 20 blocks. For this block, I also flipped the star points around just to see if it made much of a difference as to whether the more saturated HST or the brighter HST was beside the lightest of the yellows in the centre 'whirl'. 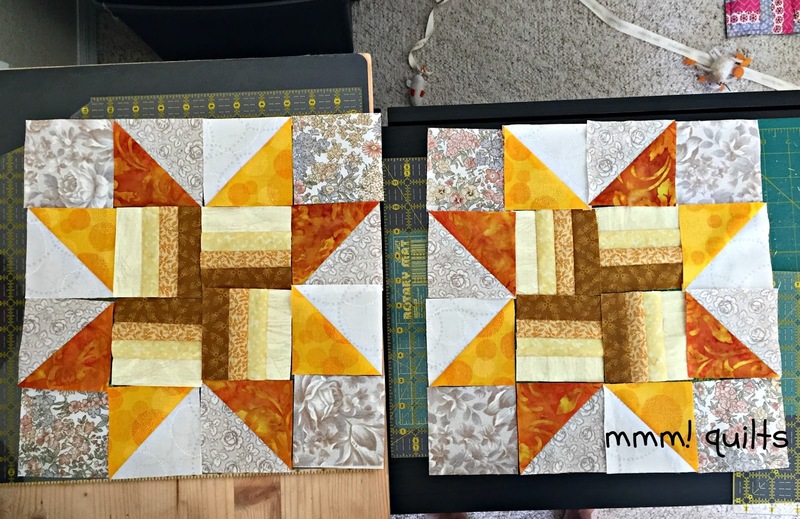 As you can see the block on the left is the way I ended up piecing them both. I put them on the design wall in ROYGBIV order. It was tricky because I had a grey star with a bit of acid green hints, and a brown with pink hints...where do those fit in? Brown is a mixture of all colours, no? And grey is a whited out black, in other words, a tint, just as pink is a tint of red, which is why I put the pink in front of the red star. In the end, or at least as it stands right at the moment, I put the brown with pink highlights beside the pink star. What do you think? 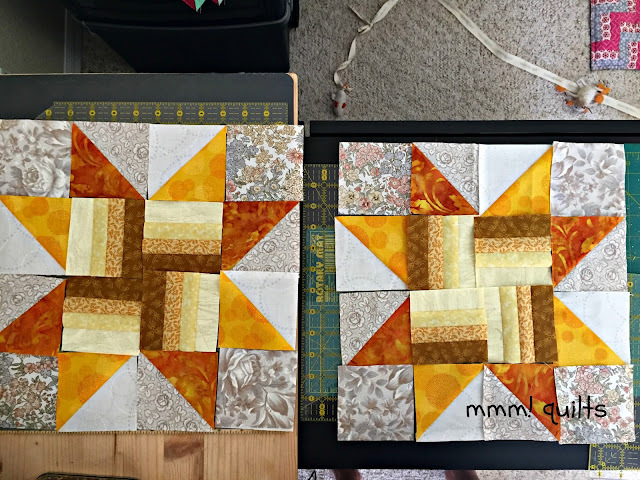 Part of me wants to separate the blocks with lattice, but a bigger part of me says nope, enjoy the scrappiness (and the less work, lol), and the modern feel to it. In this layout, it will finish at 48.5X60.5"
That area measures about 32X39". Obviously it will shrink considerable when put together. I have a whole bunch more slabs like the above from previously working on it, as well as a schwack of smaller chunks that need to be sewn up into squares and rectangles like the above. I don't know...the jury's still out on it being lovely scrappiness or scrap vomit. I'm leaning to the latter currently, although it does make me smile thinking of the various projects, some fairly recent, others ancient (like scraps I came across from my Trip Around Alberta quilt I made in 2000, so 17-year-old scraps, egad!!) that I made with these fabrics. Now if I can just stay focused on the RSC 2016 project #1 quilt assembly, and project #2 finishing blocks, and then assembly of quilt, and Cheryl's Meadow Mystery assignment, oh, and test the hockey block for Cindy, well then I think I will be going full steam on the cows quilt. Just how many projects did I bring down? Well that's a subject for another post. I did waver a bit from my resolve to not buy fabric 'just because'. I got an email from Alyssa at Pile o' Fabric and helped her clear out a few yards. Her sale was better than my LQS's Black Friday sale of 40% off because she only asked that you buy 1/2 yard minimum, whereas my LQS asked you to buy 1 yard minimum. All her prints are 45% off. No affiliation to either, but Alyssa's sale is still on and she has some beauties. I picked up a couple pieces of Katarina Roccella's Avant Garde which I got in my fat quarter club gift 3-month subscription from my husband for Christmas last year (well really as told to do by Dayna). Avant Garde was my favourite collection of the three months. 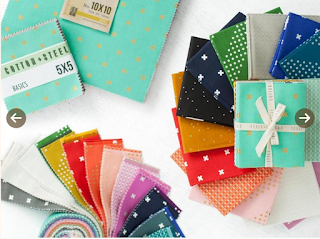 If you haven't checked out or taken advantage of Craftsy's Black Friday sale that ends Monday, Nov. 28 at midnight MT, then get your hiney on over there. They too have some terrific deals which I mentioned in my last post. The best, IMHO, is their classes deal. $17.99 for any class. Remember that's ALL classes, not just quilting. And kits! I've bought a few, okay several over the past 3 years of membership, one of which, a knitted scarf, I'm currently working on. Look at this cute beanie you can scoop for $6CA! You read that right! Aww! I need to knit one for Brady. I did knit myself the Fisherman's Wife Cowl. They also have a crocheted version too. I absolutely LOVE it, and I've worn it several times. 1. 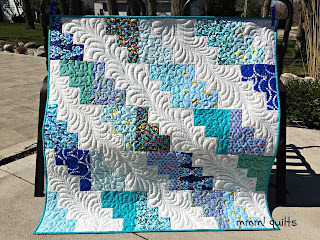 My pattern Blue Skies and Sunny Days is discounted today only to 45% off. :-) I figured if I took advantage of Pile o' Fabric's 45% off prints, I would pass along a similar deal. 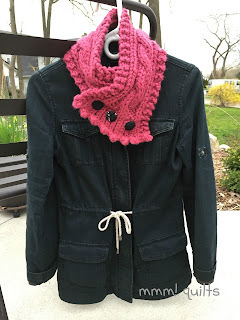 So $4US for a pattern that is easy, quick and has two sizes, and two methods of construction. Happy Cyber Monday shopping! First, I'm going to watch some more Netflix, "The Crown" to be specific. It is just excellent. What a great block, I haven't seen that one. Your quilt will be beautiful! Fact of life: Sewing scraps creates more scraps. You are on a roll, lady!! I love those stars, I think you should leave them just as they are without sashing. Yes those darn scraps never stop growing, they generate way faster than we use them, you are not in that boat alone my friend!! I am such a sucker for star quilts, and yours is looking GORGEOUS! 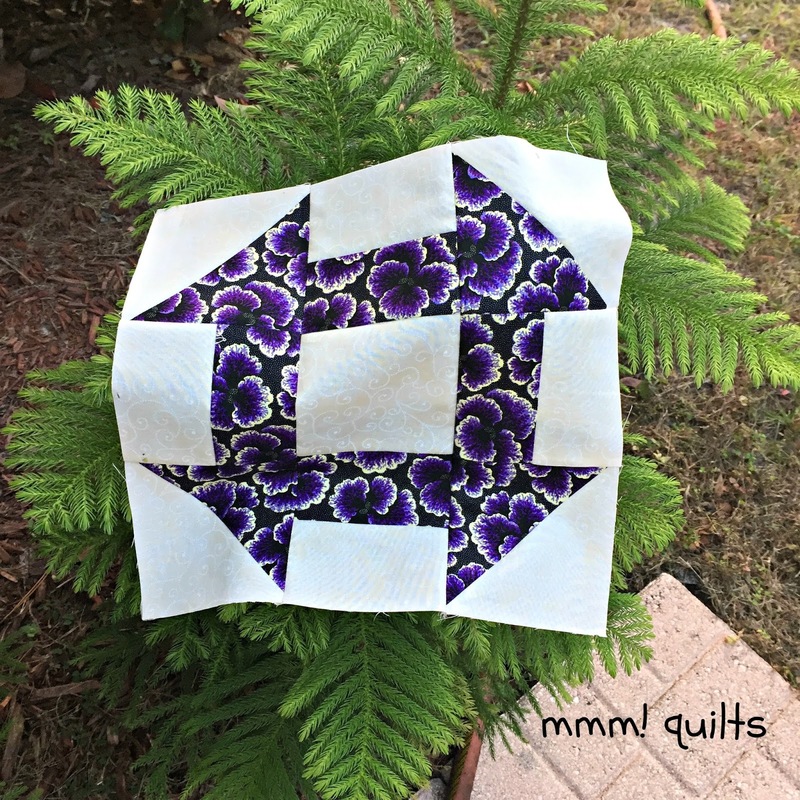 I absolutely love the effect with the strip pieced centers. As for lattice: I think that might work against the strong geometric appeal of this quilt. The blocks look great the way they are. Other options to consider would be either star sashing, or offsetting the columns of blocks(with half blocks at the top and bottom of every other row). I think the layout you settled on looks fantastic, and I love that each star is "swirling" in the center. I vote for no sashing, and it will be fun to see how you finish this one! I really love your star quilt as it is. I would sew it together, and get it done. 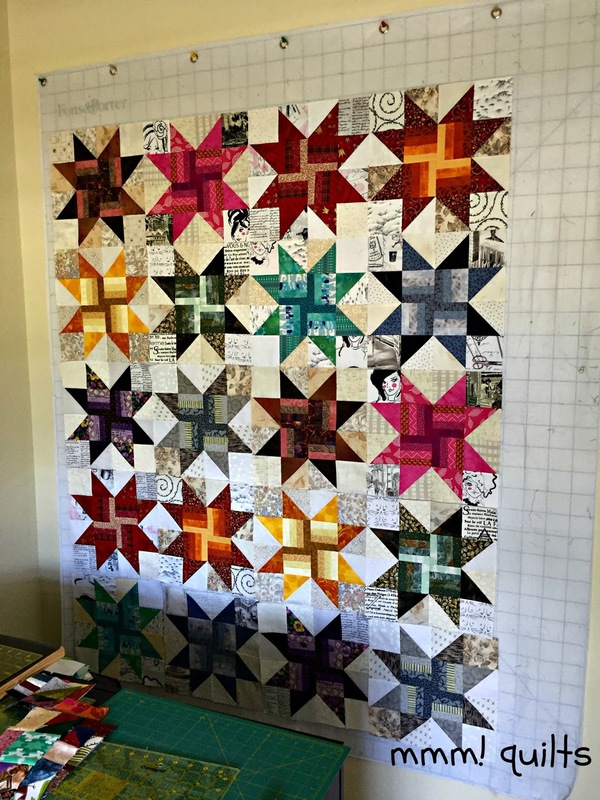 Your scrap vortex quilt is coming along really well. Its one of those projects that takes forever but I think you will love it when it's done. Well my ultra talented sister.....these are all beautiful. 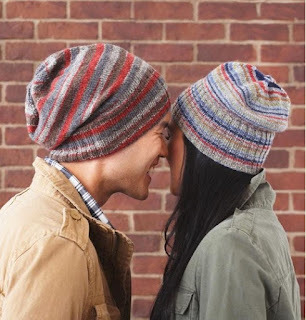 And Brady would look ADORABLE in that beanie! Those rainbow blocks look so good on the wall, and I like the darker strips in the centre together so much better than the pale ones. Super orange/yellow and golden brown colours. No sashing I think it would take away from the blocks. Love the layout you have! Scrap vortex...well hmmmmm. 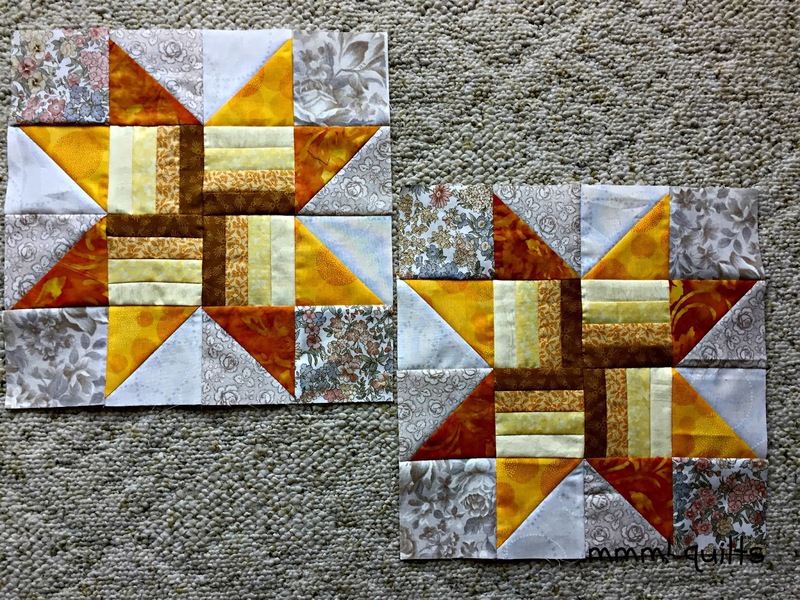 Love the orange and yellow star blocks - touch of fall colors as winter looms ahead!! Wow, your design wall is such a feast for the eyes. I can talk about scraps all day. Love the direction you are taking with those slivers. Hope you had a good Thanksgiving holiday. I survived mine, thanks to Paul! What would we do without Google?! There's a lingo that you quilters have that is almost a foreign language. Luckily Google is always ready when I type in "churn dash quilt" or whatever is my new hmmmmmmmm...? word. Yay! Google shows the picture, then my mind picture is satisfied, and I can read on. :) Pretty churn dash block, by the way. You have so much eye candy hanging around your blog today. (well, yesterday!) Thanks for the hints of places to buy fabric on sale. I'm sure we all need some, right? Wink, wink? So glad you found the missing fabric. Wow! Your whirling stars looks fabulous all together. And I love seeing your vortex pieces. Those star blocks are very cool, I like how the insides look like they are swirling. Beautiful stars in your RSC project. I like it without the sashing. All the blocks look great together so the placement works. Placing black, brown and gray is always a delema for me when laying out those RSC projects. Fabulous stars! I love them just the way they are!